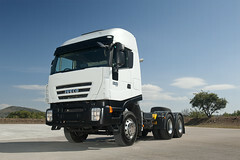 The NEW STRALIS is the outcome of IVECO's commitment to increasing your productivity. That's why we've focused so much attention on reducing Total Cost of Ownership (TCO), by minimising operating costs (consumption and maintenance) and maximising residual value and the efficiency of fleet management. DRIVER 33%: IVECONNECT FLEET enables you to keep a constant eye on your drivers' driving and rest hours, thus avoiding fines and increasing the overall availability and efficiency of your fleet. The integration of the data into your IT system optimises and automates logistical activities, and significantly reduces costs as a result. INVESTMENT 8%: A product's residual value reflects its intrinsic quality: that's why we've developed a new cab with top-quality materials and innovative on-board equipment. REPAIR AND MAINTENANCE 5%: Maintenance and assistance: the NEW STRALIS offers peak performance in this area too, with specific services for maximising productivity, such as ANS 24 non-stop roadside assistance and ELEMENTS tailored after-sales programmes, at an extremely competitive price.